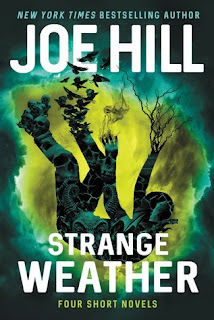 Strange Weather: Four Short Novels by Joe Hill is highly recommended collection of 4 novellas that are independent stories. Snapshot: Michael is a thirteen year old boy who must protect Shelly, his elderly neighbor who has dementia, from the person she calls the Polaroid Man. Michael meets him, but he thinks of him as The Phoenician because of the tattoos he sports. The Phoenician has an odd looking Polaroid-like camera that he uses to erase memories. Aloft: A young man agrees to skydive to impress the woman he loves but ends up crashing on a solid object obscured by a cloud. The cloud/object seems to have the ability to read his mind and tries to provide what he needs. Loaded: Gun violence connects the characters, an adulterous couple, a mall security guard, and a local journalist, in a Florida town. The mall cop stops a mass shooting, becoming a hero, but then his story comes under question. Rain: A rain cloud approaches Boulder, Colorado, and the storm contains a deluge of nail-like razor sharp crystal shards, killing almost everyone caught in the storm. 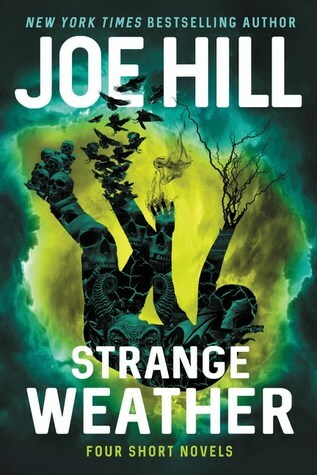 It is uncertain if the apocalyptic event is from climate change or chemical warfare. Apparently the disaster is spreading and from now on the nail-like crystals may be what fall instead of rain. I loved two of the stories in this collection, Snapshot and Rain, and I liked Aloft quite a bit. Loaded was my least favorite of the quartet, mainly because it felt more like a need to express personal emotions and political views over guns and it seemed to run on way too long. All in all, though, this was a strong, well-written collection of stories.